Choose lean cuts of meat such as beef round, loin, sirloin, pork loin chops, and roasts. All cuts with the name "loin," or "round," are lean. "Select" grade meat is leaner than "prime" or "choice." Choose fish, shellfish, and poultry (take off the skin) often. They are lower in saturated fat. Buy low fat and nonfat versions of dairy products. Read food labels and choose those foods that are lower in fat, saturated fat, and cholesterol. Use less of all fats and oils, especially butter, cream, sour cream, and cream cheese, which have a lot of saturated fat. Gradually replace whole milk with 2% fat milk, then 1% fat or skim (nonfat) milk for adults and children age 2 and older. They may not even notice! When cooking, replace fats that contain saturated fat, such as butter and lard, with small amounts of unsaturated fat such as vegetable oil, corn oil, soybean oil, olive oil, peanut oil, or canola oil. Broil, roast, bake, steam, or grill foods instead of frying them, or stir-fry with just a little added oil or broth. Trim all fat from meat before cooking. Remove the skin from chicken or turkey. Spoon off fat from meat dishes once they have been chilled in the refrigerator and the fat has hardened on the top. Use skim milk or low fat milk or evaporated skim milk when making "cream" sauces, soups, or puddings. Substitute low fat yogurt, sour cream, or cottage cheese for sour cream and mayonnaise in dips and dressings. Try lemon juice, herbs, or spices to season food instead of salt, butter, or margarine. Use vegetable oil spray instead of oil, shortening, or butter. Steam vegetables using a low-fat broth or water. Season foods with herbs and spices, vinegar, lemon juice, or salsa. Use low- or no-sugar jams instead of butter or margarine. Eat or cook cereal with skim milk or 1 percent milk. Use low-fat or fat-free cottage cheese, or nonfat yogurt. Drink fruit juice that has no added sugar. Broil, roast, stir-fry, or grill meats. Always buy lean cuts of meat. Use lemon or lime on fish and vegetables instead of butter or sauces. Use canola or olive oil in food preparation instead of vegetable oils. Fromage frais is fresh skimmed cow's milk cheese, but is more like a natural yogurt. It is not heat stable and is therefore best used in desserts and dips in place of cream or Greek yogurt. Try and reduce the amount of salt used in cooking and at the table as we eat more salt than we need. Flavor your food with lemon juice, herbs, spices or mustard instead for healthier, tastier food. Use pulses such as peas, beans or lentils to replace some of the meat in traditional recipes for shepherd's pie, casseroles, lasagna. They can also be used in soups and salads. They are low in fat and high in fibre. Tinned beans are more convenient to use but are more expensive than dried ones. Rinse canned vegetables before cooking. Be careful of cross contamination. Don't use the same plate or container for raw and cooked food. Throw out anything left out for two hours or more. Remove the roots and part of stem of fenugreek leaves. Wash the leaves thoroughly and chop them. Apply 1 tsp of salt and keep aside for an hour. Squeeze out water from the leaves and wash them. Grind fenugreek leaves. Heat oil and fry chopped onions. Add ground fenugreek leaves and spices except garam masala and fry. 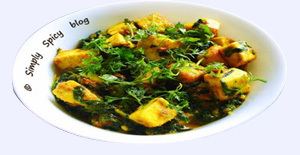 Fry cubes of panir in remaining oil and add along with water to the fenugreek. Cover and cook till gravy is thick. Add garam masala and lime juice before serving. Adolescence is a transitional stage in life, linking childhood to adulthood. It is a period of final growth spurt which causes increased demands for energy and other vital nutrients. A sensible and well balanced diet will help an adolescent to maintain sound physical and mental status. Adolescents are notorious to have "poor food habits". Due to high intake of junk food and skipping of meals, they are predisposed to obesity, osteoporosis and Diabetes in later years. Due Psycho social reasons, a teenager may become anorexic (eating too less calories) or may have Bulimia Nervosa (Gorge and Purge syndrome). Aging is a gradual process which affects nutritional status through common physiologic changes like weight loss, loss of appetite, diminished sense of smell and taste and reduced metabolic rate. A well balanced diet may postpone onset of diseases and reduce complications. Adequate nutrition is essential in later years of life to improve functional capabilities and maintain overall health of older individuals. In addition to balance and proportion, the diet should be soft in consistency to aid digestion. Small frequent meals in a day instead of three main meals are better tolerated by an elderly person. Processed and refined foods must be avoided and fat should be selected from unsaturated sources like sunflower oil, corn oil and nuts. The diet should emphasize on high fibre and high fluid intake. Snack Weetabix in skimmed milk with flaxseed. Grilled chicken, lettuce and cucumber. Vegetable Noodles with Sprouts, peas and mushrooms. A pot of Fromage Frais.